Today I've got some uber cute nails to show you! I decided to try out a few of my newer Vivid Lacquer stamping plates, and let me say I'm loving everything about them! 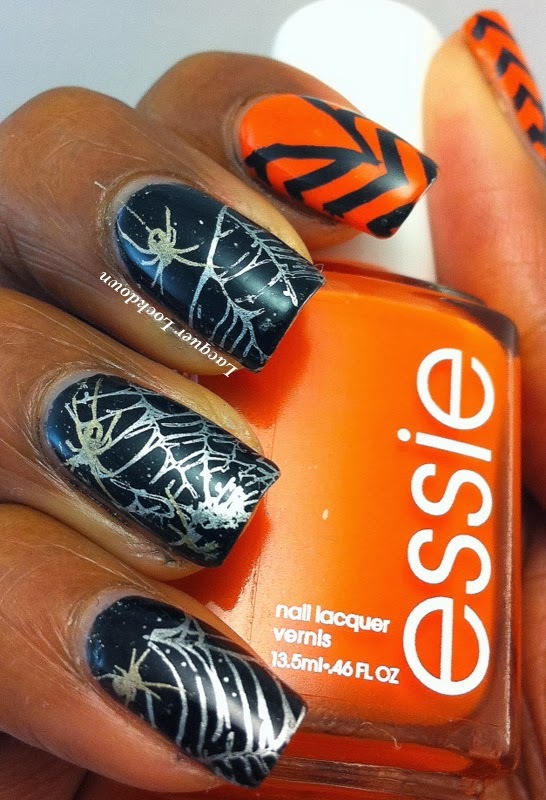 I wanted to try and create some fun nail art that was pretty and Halloween themed without heading down the pathway of gore. Lol that's not to say I won't be heading down that pathway ever but I am more of a glamourous and pretty type. That had me reaching for my Vivid Lacquer plates which feature just enough fiendishness combined with pretty to satisfy my tastes. I'm not sure if you knew but Anni recently created a Autumn/Halloween themed plate. What I love the most about it are two images in particular! One is a huge spiderweb. It could easily stretch across all 4 of my digits if I stamped it serially. The other is a graveyard image that has yet to be used but it will be shortly. 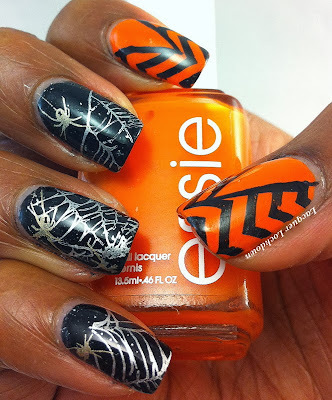 This is a cute and versatile plate that has the potential to create about 5-10 or more Halloween mani's if you got creative. I'm not sure if it's currently available, but you can get it here. So cute!! I always love when you do a trigger finger mani!